Chris Williamson was one out of a handful of MPs attending the 2018 Labour conference that happily agreed to a short interview for Unity News but unlike most, he spent time with me, speaking to me and listening to what I thought. It’s very rare to have an interviewee ask the interviewer questions but that is exactly what Chris did, he was genuine and warm but most of all passionate about the Labour party. Winning elections, making it more democratic and supportive of socialist policies and of course its socialist leader. He spoke to me about how we can win elections and how it was a shame that open selections, which Chris had been championing across the country in his democracy roadshow had not been voted for. Though he was optimistic for next year. He was glad that some changes had been made to the trigger ballot system, which would make it somewhat easier for grassroots members to trigger an open selection. Many berated Mr. Williamson for the gusto in which he campaigned for open selections. Accusing him of targeting centrist MPs but he merely sought to improve life for local members and trade unionists so that MPs pay more attention to their members and constituents as often Labour MPs sitting in safe seats are guaranteed a job for life. 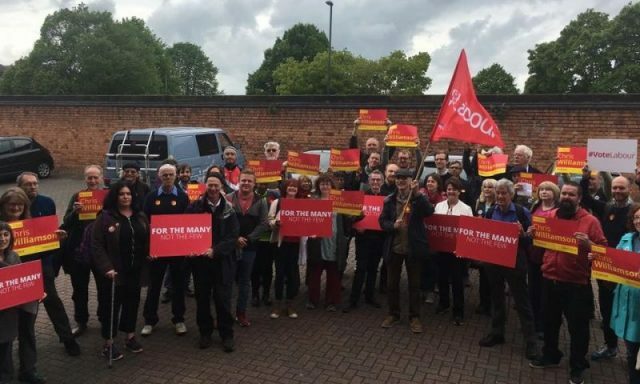 Open selection, if it had won traction at the conference, would have meant that every election the local MP would have to face their membership before being reselected to stand as Labour’s candidates again. It seems fair right? If your MP doesn’t do a very good job you get to tell them so and give someone else a turn. It certainly would keep MPs on their toes and may also allow for a fairer system for people to become MPs. Obviously, if you are doing a great job, you would be reselected so no problem. When the integrity initiative scandal came to light mostly only on social media because many well-known journalists were named in the files, Chris Williamson was one of the only MPs speaking up about it. He even went off to Fife to investigate. He continuously fights for greater democracy for members and it has been portrayed as if he is doing something underhanded by doing so. Even without his Integrity Initiative investigation or his support for the Palestinian cause or anything else Williamson has highlighted, his democracy roadshow put a big X on his back from the centrists. What got him, in the end, was Chris’s outspokenness on antisemitism. Something we’ve become all too scared to talk about but Chris wasn’t and he said what many would certainly agree with, if they weren’t too scared to in case they get lynched too. A video circulated on social media of Chris saying that “we’ve backed off too much, we’ve been too apologetic” in relation to the antisemitism accusations against the party and its members. At the time he was also responsible for arranging a screening of a film in parliament called Witch Hunt which defends Jewish activist, Jackie Walker who has been expelled from the party over comments about anti-semitism. The screening was to be hosted by Jewish Voice of Labour who rejects the accusations that the Labour party has an issue with antisemitism. These actions were enough to see Chris Williamson suspended from the Labour party, as pressure from the press, Tom Watson and hypocritical Tory MPs grew. It also proved his point emphatically. Chris Williamson has been a life-long anti-racist campaigner, he was responsible for organising Holocaust memorial events and stated that anti-semitism is a scourge on society. In fact, in the video he actually states “we have done more against the scourge of anti-semitismtism than any other political party” and yet it was used against him to accuse him of anti-semitism. What is sad is that in all this flurry of antisemitic accusations, antisemitism has become weaponised and is now becoming the stick to beat the left with. The very people that try to make life better and more equal for all, don’t know how to react to such accusations and of course, we are apologetic because any insinuation that we are not eradicating racism and spitefulness towards any religious group is grotesque to us. Though many can see that this has become trope continuously used to attack the Labour leadership and anyone that is supportive of it. Yet the threat of suspension if we speak out against it and to express suspicion of these accusations is silencing us. Even to the point that one of our greatest allies, one of Jeremy Corbyn’s greatest allies became suspended, merely for standing up and speaking for what he felt was right. This suspension is wrong and he must be reinstated immediately and that is why we stand with Chris Williamson and you should too. I stand with Chris Williamson.